Paying Ready Attention: The circle completed. It’s well past New Year. It’s a while until my birthday. It’s a long time until next Christmas. It’s summer now, but soon it will be autumn. Spring seems distant, winter a memory long gone. We seem so still. Still, while time and the seasons turn around us. So still that we do not notice the movement and flow. We embrace the myth of stillness and solidity, seeking refuge from the circles and cycles of change. Yet everyday we pass through and over, everyday we spin and change. Every single day we play a part in the circle completed. It’s much cooler on the water than on land; wind washed, sea sprayed. As the land draws away and we move out into the Bay, shapes grow from the sea surface to form solid objects. Islands, natural and manmade, channel markers. Bright signs that warn of danger, bright signs to keep us safe. The bow of the boat skips on the waves and people laugh at the salt spray shower. Protectively I fold my arms across the binoculars that hang from my neck; other people wipe the sea from the lenses of their glasses and cameras. I love being out in the bay. With its own protective arms of land, it’s a reversal of the way maps were once drawn, with the land surrounded by an encircling sea. Only if you look out to The Heads can you see past the land and out through the ocean haze. The Heads are the narrow entrance to Port Phillip Bay, a passage through which ships must be piloted by the skilled and the experienced. Its shallow reefs of sharp rocks and ancient flooded cliffs have claimed many boats. The rest of the bay is seemingly benign, where the chance of striking rocks is low. But the shark tooth of stone is replaced by the soft hand of mud. To be in the middle of the sea and know the depth is less than two feet is strange. For large boats to move through the Bay they need to follow the ghost of the old river that flowed when the world was still iced and so much water was held, frozen, on the land the sea shrank and pulled away. Subtle shifts in the cycles of Sun and Earth, deep shifts in the behaviour of the Sun, pushed the Earth and its water in the direction of ice and cold. Those cycles still exist; but other, newer, forces are pushing the Earth’s water in another direction. We have left the time of ice and are entering a time of greater water. The ice retreats, the oceans grow. The beach comes to us as we go to the beach. On the ocean there is no stillness, only flow and change. When we arrive at Mud Islands the boat cannot find a gap in the weedy barrier that fringes the dry land. We try one place, then another; eventually we find a breach and wade ashore. There is movement all around. We are surrounded by flying, calling birds. Young birds, some not yet airborne, some uncertain on new found wings. Adult birds, still crisp in breeding plumage, hover over the younger ones calling in shrill, sharp voices. 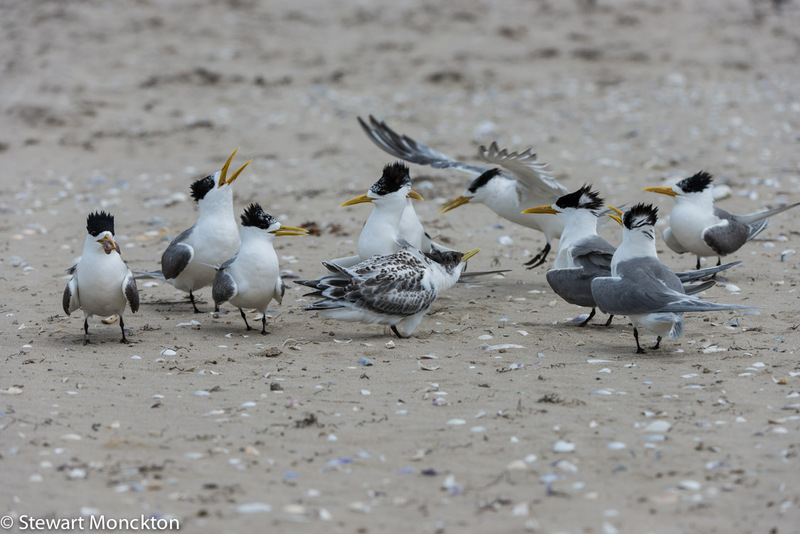 Most of the birds are Crested Terns, some are Silver Gulls; all are combinations of white and grey. 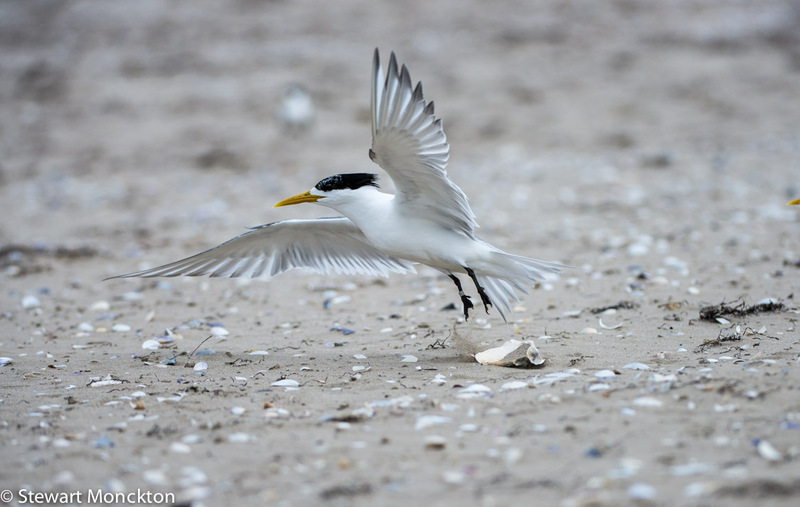 The terns sport a dark head and wind blown crest, the gulls blood red bills and feet. Within one small patch of sand, adults and their young scream and fight, feed and fly. In four weeks this part of the beach will be empty, and the only sign of what was here will be the flickering wings of the dead, buried in sand, taken by chance or illness or the losing hand of genetics. But on this day we land to a beach full of life, and the embracing sand will have to wait for the cycle to come full circle. The walk around the islands starts at the end. On departure, things unneeded on the journey are left in the blue-green bushes to await the return of their owners. Many walks start and end at the same place – the resuscitative evening stroll, the ambitious mountain walk (planned to impress), the pram push that sooths both adult and child. But most of these walks are only circles in a mathematic sense – they begin and end at the same place, they have no repeat sections. Net analysis would see no difference in them from a perfect circle – a journey that rotates around a fixed point. But the journey around Mud Islands is almost a circle in a real sense – albeit, the type of circle drawn by an unsteady infant hand. From the air the islands take the form of a yin and yang sign, with the upper and lower portions of one reaching out to hold the other. Ocean currents and the whim of drifting sand fill the space between the two with shallow, bird rich, water. Some areas are always underwater, some are only fluid on the highest of high tides, and some have remained dry for a few years. Today’s aerial photograph may show the current shape, but maps and charts cannot catch the cipher that is the form of these changing islands. Even if you walk around the island to find its form, the shape of the journey will be determined by the state of the tide. A walk two hours later or earlier would have yielded a different shape. Our knowledge of the exact attributes of the island are as fluid as the water that surely surrounds it. At present the island can be reasonably expected to be more or less where we expect it to be. At present we can reasonably expect the walk around it to take about four hours. At present we can reasonably expect to find birds of a certain type on the islands. But the fine details of these expectations are conjecture. On all of these points we can have confidence, but not certainty. It’s an important point. Whatever cycles drive the dynamics of the island and its populations, we can have no absolute certainty about what we will find when we visit. This is the basis of real knowledge; the acknowledgement of uncertainty. Once you have absolute certainty about any issue, you no longer need to think, you no longer need to question, you no longer need to take responsibility for the consequences of what you hold to be true. And people who offer absolute certainty are asking you to give up that most human of gifts; the gift that took us from the thrall of disease and the spectre of hunger, the gift that took us from the cave to the near place of space. The gift that allowed us to look far beyond the limits of the human eye and the reach of the human arm – the enquiring mind. That’s an interesting thought to come from walking around a small island, loud with the call of gulls and terns, and far from the places where most learning is offered. Lunch is taken by a large shallow pool. Waders, themed variations in leg length, bill shape and degrees of grey-brownness wander in the water. Wade. The long legged in the deep water, the short in the shallow. A few ducks make good on the promise of buoyancy and in the distance white pelicans and black swans might be standing or they might be floating. Beyond the island, but before the haze blocked shore, a huge boxy ship passes – trapped between two lengths of land, shipping in the channel. Importing TV’s, exporting jobs. Goods, capital, labour or the unrefined bones of the Earth - the currency flow of a system that makes light of human needs. A system that seems to know the cost of everything, but misunderstands its value. A system that makes much of choice. Choice that is, as long as you can pay. The mud is soft underfoot and the water is comfortably sun-warmed. Birds scatter as we wade towards them, keeping to the shallows, heading for the far shore. A strange white bird brings us to a halt in the water. With a long beak and legs it’s not like any bird I have ever seen. 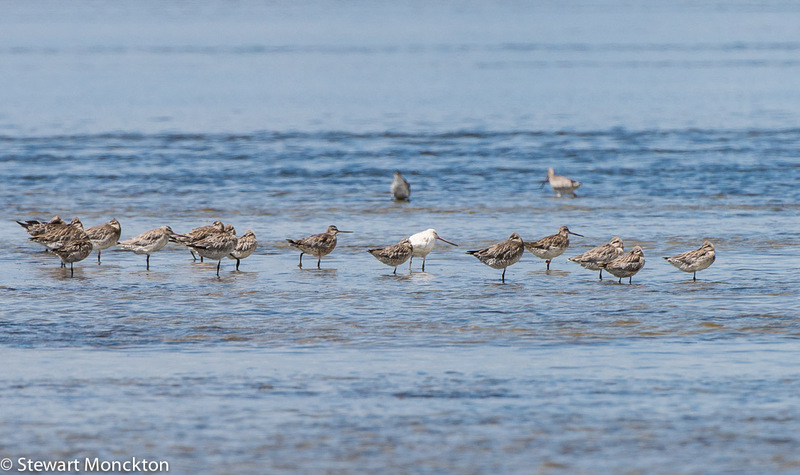 It turns out to be a Bar Tailed Godwit, stripped of colour by some strange combination of genes and metabolism – it is called, technically, leucistic. It looks out of place, but seems at home, settled in its flock, feeding like all the others. The water shallows and the mud firms as we approach the land; shells and the ghosts of crabs gather in the shallows. Living crabs sidestep the issue and move back to deeper water. Silver shadow fish dart away. Some of my fellow walkers swap shoes – wet to dry – just before the land sinks again. Around the bend of the island, scraggy leaf bare bushes grow almost to the water’s edge. Each bush is collapsed in the middle, compressed by nesting pelicans. Most have have long since left the colony, and now feed out in the bay. A head, strangely remote from its body lies in the sand. It looks more geological than biological, more fossil than fowl. 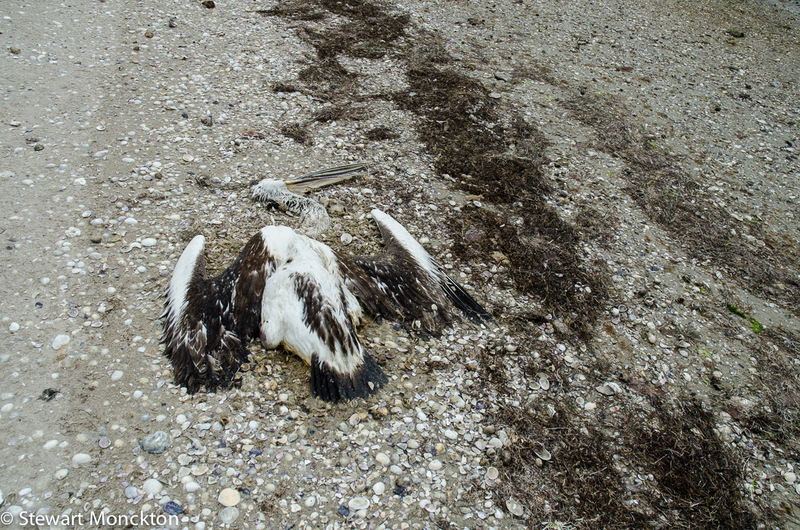 Further down the beach a whole bird lies like an arrow head on the high tide line. Its wings are open but still, its beak open but silent. Members of the group express a kind of horror at finding a bird like this. One clamps her hand over her nose and mouth and runs quickly past. “It stinks”, she says. While there is some truth in this, it’s an overstatement. I get the feeling it may be the largest thing she has seen dead – most dead creatures have been rendered down to bite size pieces, with a name that hides its origin. Beef instead of cow. Pork instead of pig. It seems the birds – chicken, turkey, goose – are some of the few meats we eat that are given a real name. It may have been her first encounter with wild life – and the gap between the words is intentional. Wildlife may come to your garden or walk past your concealing hide. But wild life is evidence of the real nature of life. Life is wild, full of death as well as life. Driven by change and uncertainty. Much of what we do everyday shields us from the wild life and to be brought face to face with its reality on a sunny beach day is a shock and a surprise. The bird is dead, but its chicks may be alive. The sinew and flesh may have lost the spark of life, but the matter will be recycled and reborn. Carbon, hydrogen, nitrogen: all the base elements that combine to form the remarkable chemistry of life will go round and round and round. It is true that we are star stuff, born from collisions in the furnaces of suns uncounted. But we are also Earth bound, tied to the cycles of the wild. The pelican is having its complexity unwound. The flows of energy needed to keep together its atoms – as uncounted as the catalogue of stars – no longer flow and from complexity comes simplicity. But in the future, when all the strands are broken, from simplicity complexity will once more arise. No hands from outside of the world of nature, no intervention from forces beyond recognition. Just cycles of matter and flows of energy. The pelican is gone, but the cycles are not. One day I may, unknowingly, meet part of it again. Another piece of excellently written food for thought, Stewart. I agree, that I think the majority of people who react in a negative or appalled way to seeing an no-longer-living animal, haven't seen such before. In some areas we are used to seeing the cycle of life more than others. We live in an area with predators, plenty of them, acting as part of the circle of life. It may make us somewhat less sensitive to coming across the remains of an animal, but perhaps more thoughtful. There's a story there, and as you so poignantly point out - the story continues. What a beautiful post Stewart. If only all blogs could be so. That first photo is my favourite - just stunning. Hope all's well over there on the other side of the world! Thanks for touring with us for the second time Stewart on our All Day Guided Mud Islands Bird Watching Tour - an internationally recognised RAMSAR site. Our guide Tania has an encyclopaedic knowledge of birds that boggles the mind. Will see you next time. Lovely piece on the cycle of life. The first two images are my favorites. Marvelous post Stewart, I'm going right back and reading it again. excellent writing, thoughts, and images. Thank you for sharing. Have a wonderful week, and thank you for stopping by my blog this week. Such exceptional detail. I am in awe. I loved this ... A quiet shore is my favorite place to walk, to meditate....your walking meditation is beautiful... A prose poem. I would buy your book, definitely, . Stewart, lovely post and images. Your writing has taken me to a place I will most likely never visit, maybe in my dreams. Well done! 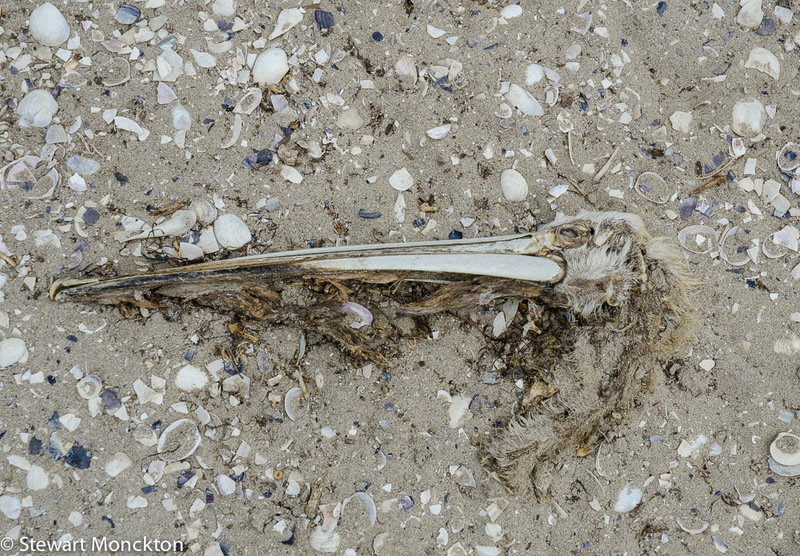 The Terns are superb Stewart, and the death of a Pelican, most upsetting, but, it has to be that way. I don't suppose you could be persuaded to pay special attention to one particular tree and joining us in Tree Following on Loose and Leafy? We have no-one yet from the southern hemisphere and it would be great to be aware of a tree with opposing seasons to our own. Great photos, thanks for taking the blogging community on your nature walk, so many interesting things to see.